with ‘the aid’, a cane that provides mobile navigation and health management services, users who have difficulty leaving their homes can become active members of society. this design takes into consideration how ICT devices can be useful in users’ daily lives and deploys services that are integrated with social infrastructure. ‘the aid’ by egle ugintaite from lithuania has received the FUJITSU grand prize – the winning entry from our recent designboom competition ‘a life with future computing‘, organized in collaboration with FUJITSU. and DA – design association japan. designer’s own words ‘the aid’ is mainly dedicated to help elderly people, or people after trauma who often have a lack of confidence to step outside their house, causing isolation, depression… ‘the aid’ is designed to be a real ‘helping hand’: to guide and prevent one from being lost, providing a feeling of security, allowing one to receive immediate help if they need it, and, of course physical support, as a walking cane. an integrated navigator, which works as a service + health device (pulse, blood pressure temperature) features measuring sensors along with an SOS button, which, by pressing it when help is needed, contacts the help center and sends the user’s current health data and location to provide immediate and qualified help. the object is simple to use (2 buttons only), but at the same time smart. 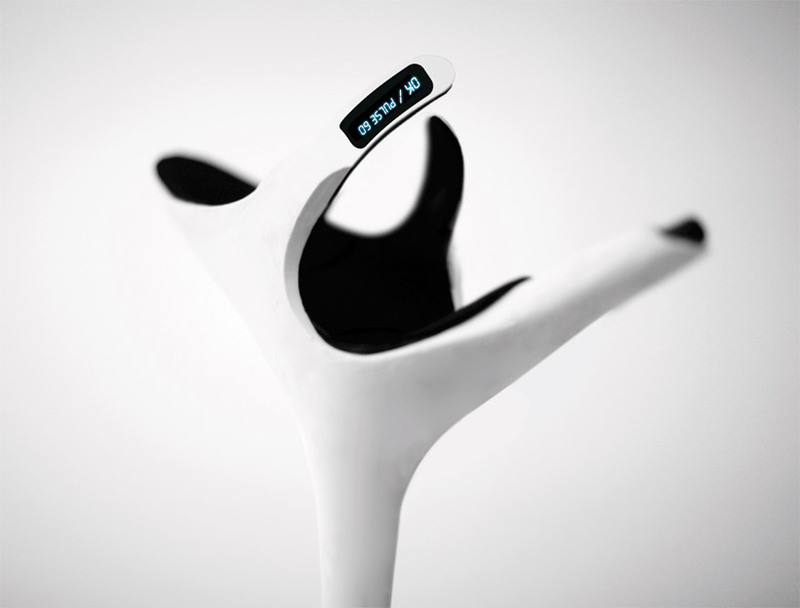 navigator, SOS button, health monitoring, cane, physical assistance. there are sensors in the wrist zone, which are constantly in contact with blood vessels. the monitor displays health data (pulse, blood pressure, temperature). a headphone is used to receive directions on how to reach all necessary info. heart of aid is our general manner and promise, like do right thing. noone says it’s bad. but Is this hi-tech cane realy something effective or innovetive to real society? why it can’t be a watch? more flexible and compact for everyone need aid. but It,s already in the market. agree with androaid, I admir what this effort trys to drive our technology toward though. congrat! just abit fissy concept included btw, like the SOS cancel?? and the headphone, which will create confusion and problems. but there are big problems in ergonomics. Hand position and how to press the button are wrong. Moreover, in case of a heart attack is almost impossible to use the affected arm to press a button. Then the arm lace may cause fractures in a fall. But the idea is good. I agree with “androaid” that a hi- tech cane if it serves the purpose, it would still address a very specific user segment – especially old age. That’s the reason why I had made a wrist based device which address the same problem at all levels – its unobtrusive and can be carried around wherever one goes, from toilets to trams. What is disappointing is my hunch ” that a fancy presentation would always catch attention” and in most cases it’s true. Have uploaded my entry on to this site, please have a look and let me know if my words are justifiable. Good luck in other competitions and congrats to the winner! you can not say Just stay behind as db editor. Congrats . not so bad. but I think when grandpa tumble down bound hand with cane is problem ,it will make new trouble and big danger. no ? But totaly hi level competition. Well, they sure did the full scale model and presentation quite fast… But if it wasn´t in the rules, fine by me.